We met when we were both students at Penn State University. We started dating when I asked him to teach me how to play bridge, in late August, 1988. He accepted my proposal of marriage on April 16, 1990, and I helped select the simple gold engagement ring he bought for me shortly thereafter; a few months later I gave him his wedding band to wear as an engagement ring on the other hand (a tradition in parts of Europe, including Germany where I am originally from). We were engaged for 3 years, because he graduated from college in May, 1990, but I didn't graduate until May, 1993. In the mean time, he worked in the Washington, DC area while I continued to attend Penn State, so we had a Long-Distance Relationship. At first, we saw each other every 3 weeks or so, but after a year he bought a car, so he could visit me about once every 2 weeks. We found e-mail to be a very important way of communicating; because we both worked in front of computers much of the day, we could be in constant contact. We didn't write long messages -- just "I'm going to lunch now", "I love you", etc., but it really helped us feel connected during the day. We also spent an hour or two per week on the telephone. I have a list of reasons why I love him. 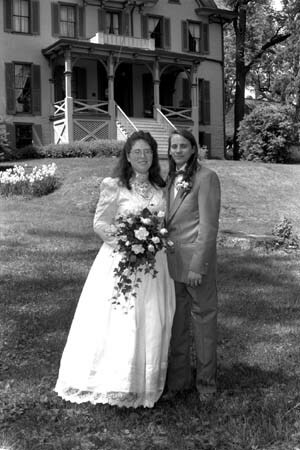 We were married Saturday, May 29, 1993 in State College, PA. Our wedding was held at 1pm at the Unitarian Universalist Fellowship of Centre County, with Rev. Don Marshall leading the service. After the service, we headed to the Centre Furnace Mansion for our hors d'oeuvres reception, which lasted until about 5pm. The Folk/Renaissance band Simple Gifts played for both the ceremony and the reception. 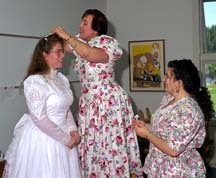 The complete text of the service is available. Return to Sonja's home page.